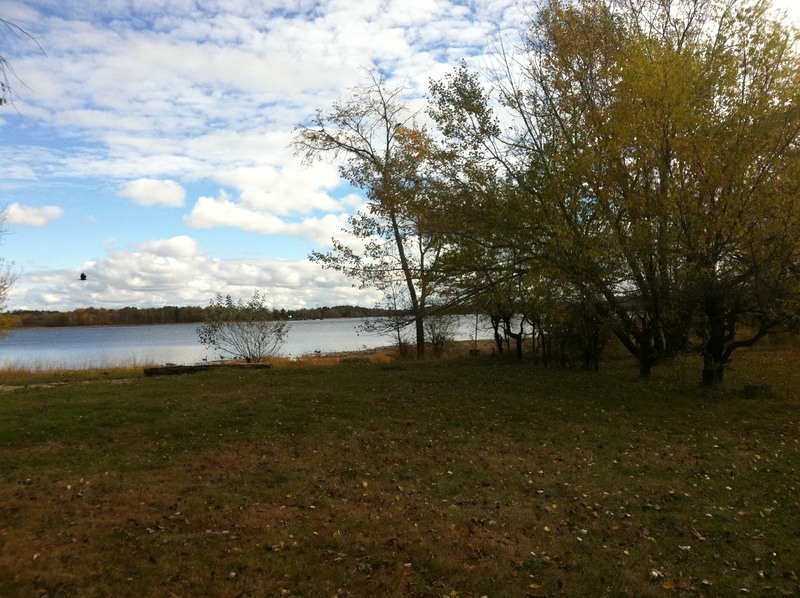 Lying quietly on the shores of the Ottawa River near Quyon, QC are remains of the Ottawa Valley’s oldest settlement and a Hudson’s Bay Trading Post. 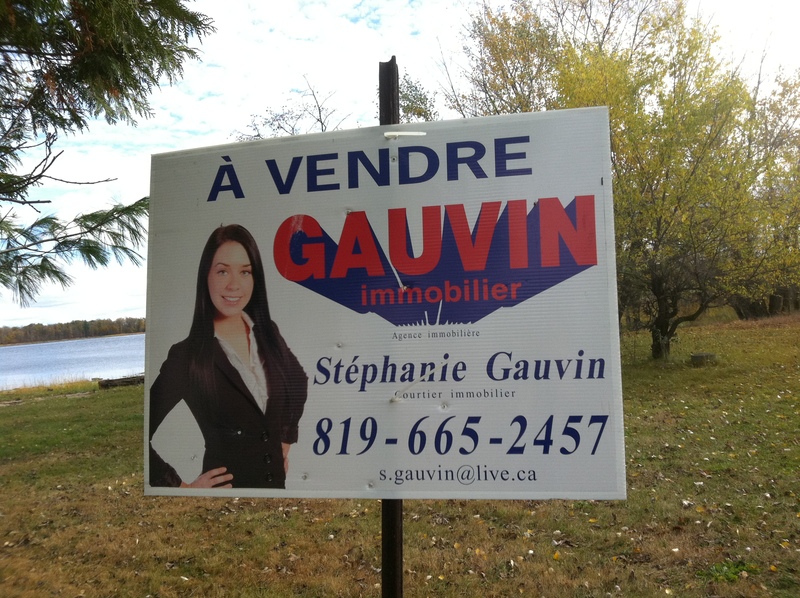 Situated approximately 57km northwest of Ottawa a nondescript piece of property was recently listed for sale. The serene $55,000 piece of real estate on the Quebec side lies a mile above Chats Falls on the Ottawa River and boasts a dock, beach and views of our kaleidoscope sunsets in addition to another curious amenity: It is part of the oldest known European settlement in the Ottawa Valley with ruins of a centuries old Hudson’s Bay Trading Post concealed nearby. A typical 1800’s trading post that would have been a similar scene at the property on Mondion Point. Before Philomen Wright arrived in 1800 from Massachusetts to settle the National Capital Region in Hull, there was another white man that settled in the wilds of the Ottawa River Valley. Traversed by nomadic tribes of the First Nations for thousands of years before any white man arrived to transport goods and copper from Lake Superior east along the Ottawa River, or “Great River” as it was known then, this property was a strategic and cultural piece of land. Samuel Champlain would have been the first white man to explore in detail the Ottawa Valley and passed by this property in the early 1600’s but it wouldn’t be until 1786 that another white man would decide to build a permanent residence here. Fourteen years prior to Philomen Wright setting up shop in Hull, Joseph Mondion arrived in 1786 on the very shores of this real estate currently for sale. 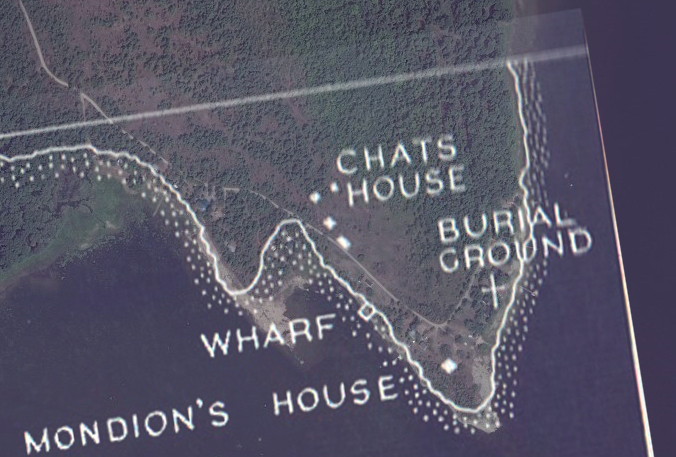 Mondion cleared the area on a point of land now called Indian Point. Known to be a major transit route for both First Nations tribes and French voyageurs and “coureur des bois”, Mondion built what is now known to be the first permanent structure in the Ottawa Valley when he built his home there in 1786. A wise entrepreneur, Mondion raised cattle and hogs and sold meat to the hungry fur traders passing by and portaging Chats Falls in the late 18th century. 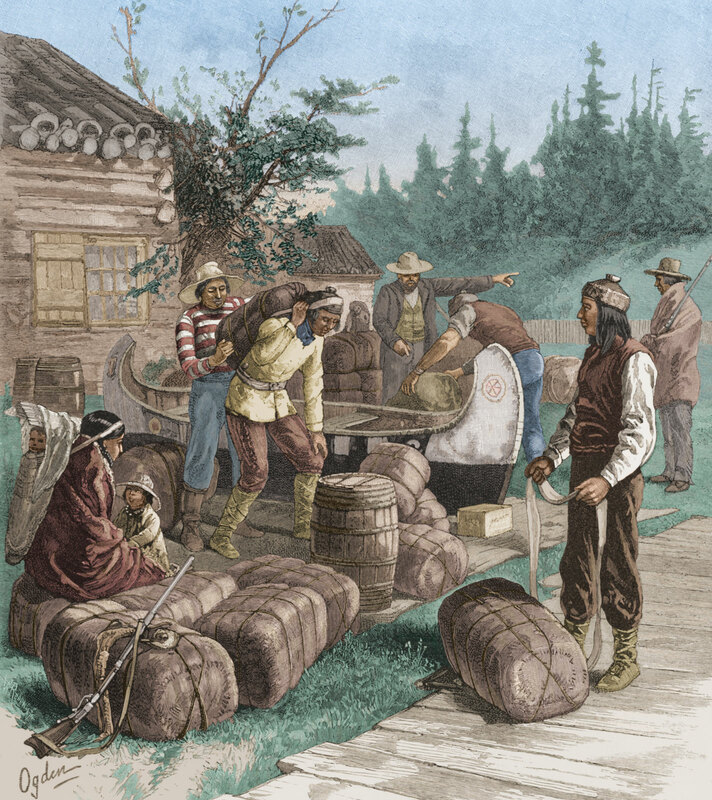 After the British took control of the previously French occupied lands of New France in 1763, Mondion operated his little trading empire on the Ottawa River until he was apparently shut down for selling illegal whisky to those en route along the river. Packing up shop in 1800, he sold his piece of property to a trading company from Montreal: Forsyth, Richardson and Company. In 1804 the Northwest Trading Company took over the property, a valuable piece of land known to be a strategic fur trading point along the Ottawa River. The North West Company of Montreal and Hudson’s Bay Company were forcibly merged in 1821 by order of the British government in an effort to end the often-violent competition between the two trading companies and the piece of land became an official Hudson’s Bay trading post. This once remote outpost consisted of log cabin structures and wooden outbuildings that would contain the inventory needed to trade with natives, such as guns, blankets, iron tools, and clothing. 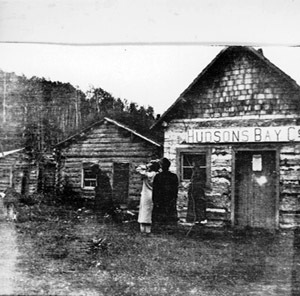 A typical Hudson’s Bay Trading Post in the 1800’s. In 1837 the trading post was abandoned since most of the native population had been displaced and the fur trade was coming to an end with lumber being the new commodity along the Ottawa River. The trading post log cabins fell into ruin and the land was transformed into farmland until it became cottage country, of which it remains today. 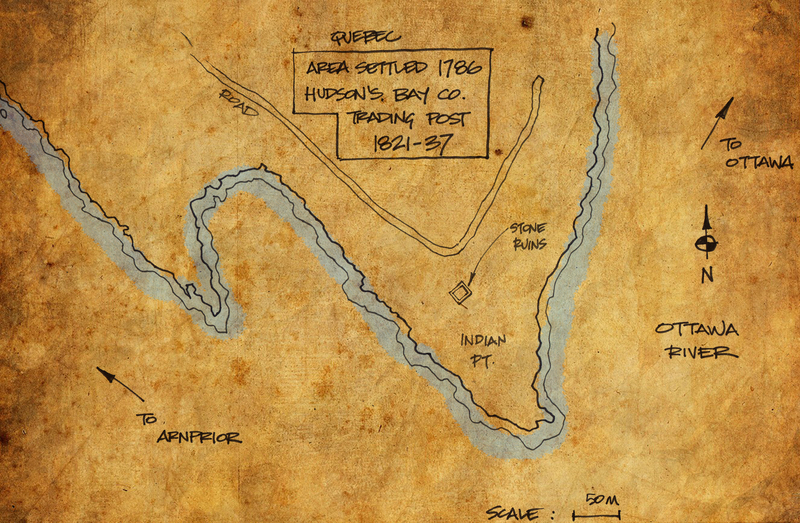 In an effort to locate this once prosperous 200 year old Hudson’s Bay Trading Post I referred to an 1805 map by the Northwest Trading Company that outlined where the original structures would have been. 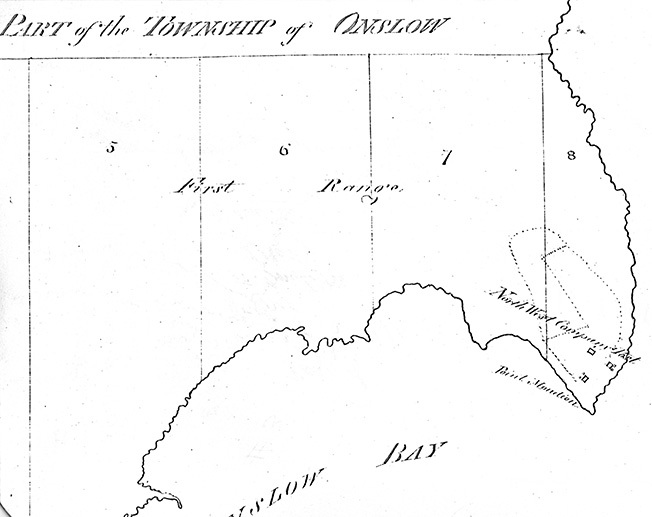 Transposing that map on a current aerial view map indicated where any ruins may lie today. With that information I visited the area and found not only the possible remains of the original Mondion and/or HBC structures but also that a piece of this significant Ottawa history is currently for sale for at a mere $55,000. You can view the listing here. 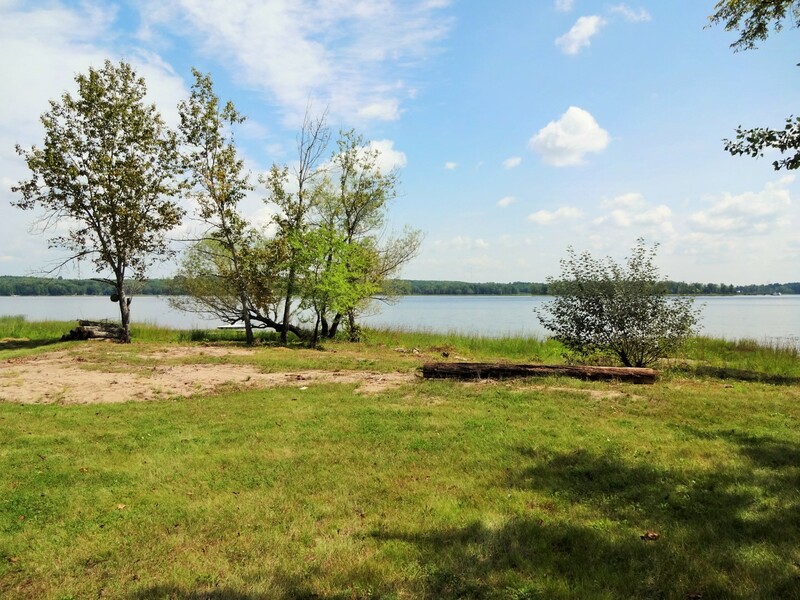 A parcel of land that was once part of the Ottawa Valley’s oldest settlement and a Hudson’s Bay Trading Post is now for sale. 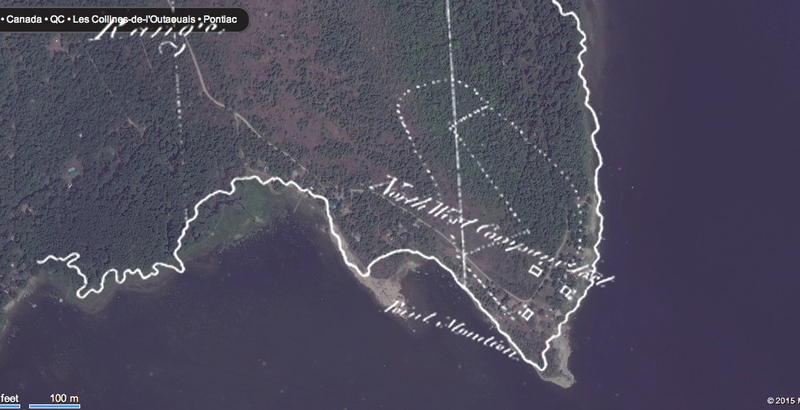 Of course the original plot of land settled by Mondion and used by the Hudson’s Bay Company has been subdivided into many lots since they departed, but a significant parcel of waterfront land that was once owned by Mondion and the Hudson’s Bay Company is up for sale. 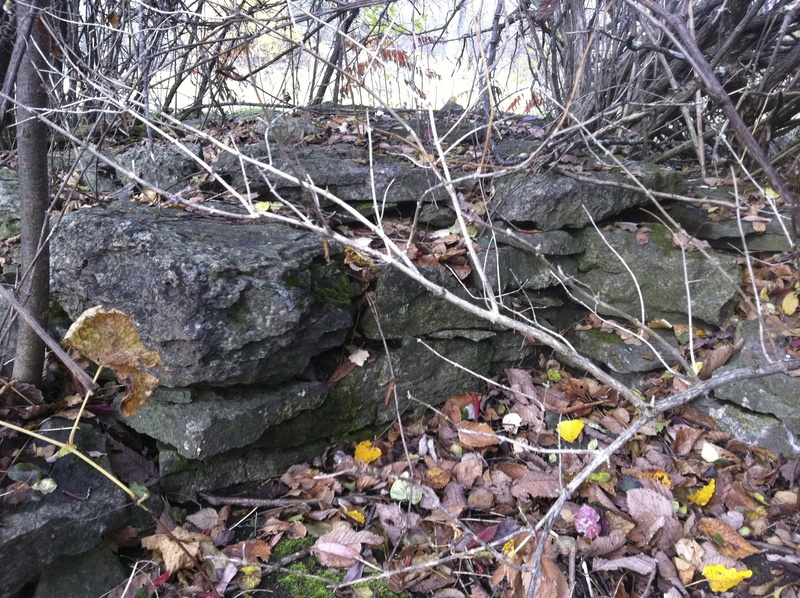 Nearby off the main road it was also discovered that some overgrown stone foundation remain, perhaps of the original 1786 Mondion house and the 1800’s trading post, on whose property it is unknown. The crumbling stones of this once bustling fur trading dynasty now sit quietly forgotten in the bushes. Concealed under the cover of bushes and underbrush, the original stone foundation of a structure is visible. This could be the remains of Mondion’s original home built in 1786, the oldest known pioneer settlement in the Ottawa Valley. 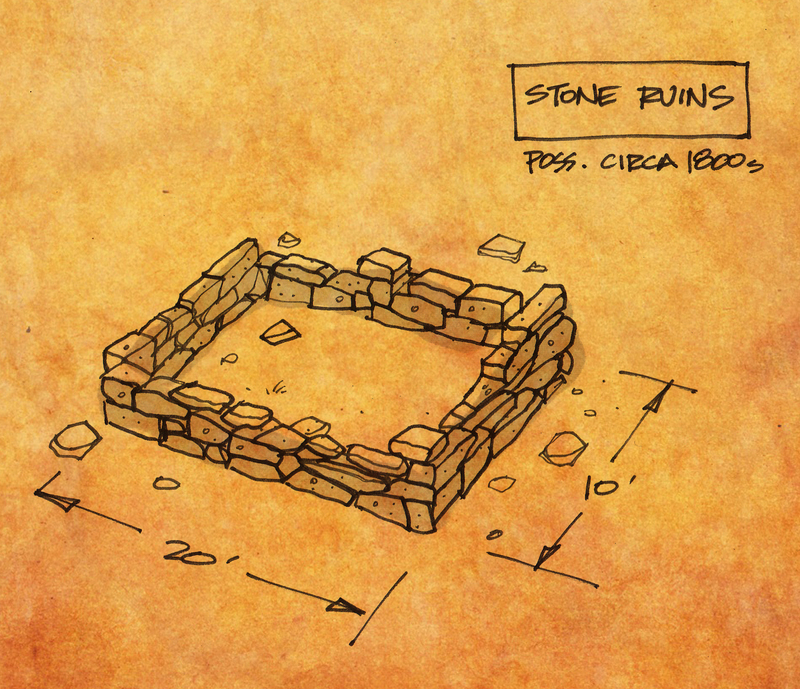 The stone ruins measure approximately 10ft by 20ft. 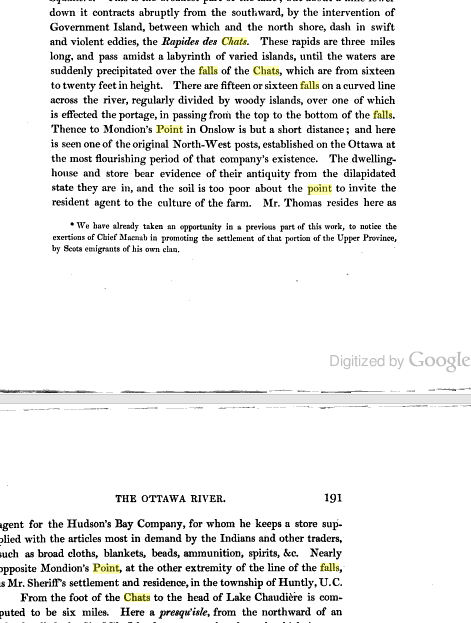 It seems a shame that the area of Ottawa Valley’s oldest pioneer settlement and a Hudson’s Bay Trading Post lie forgotten on the shores of the mighty Ottawa River. I find it seriously disheartening that such an important piece of Ottawa Valley history, if not Canadian history remains forgotten, up for grabs to the first person who has $55,000. This is certainly an important part of our national history that I think should be considered for recognition by the federal or provincial government. Who knows what important artifacts lie beneath the surface of this available real estate. The ruins, whoever they belong to, should also be recognized in some manner. Perhaps I’ll call up the Hudson’s Bay Company Customer Service department to see if they are interested in setting up an outlet there again. I can also call my bank to see if I can extend my line of credit to buy my very own piece of important Ottawa Valley history. The Upper Ottawa Valley by Clyde Kennedy, 1970.